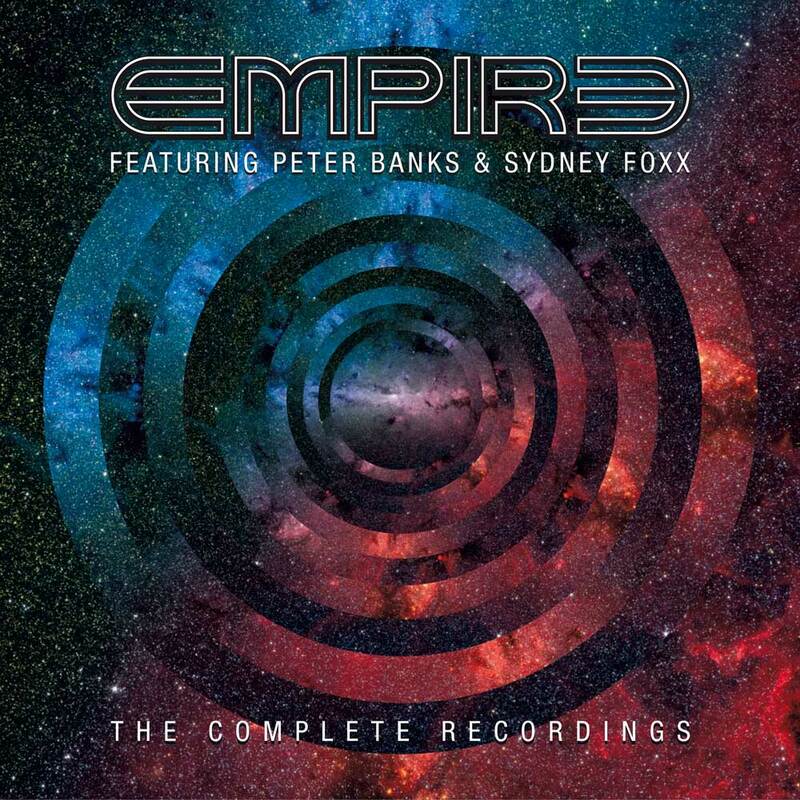 I could not be any happier when I first heard about the new Empire 3 CD Box Set: Empire (Featuring Peter Banks & Sydney Foxx) – The Complete Recordings. The first release from the Peter Banks Musical Estate. Fully endorsed by lead singer: Sydney Foxx/Sydney Jordan. All three Empire studio albums; Mark I, Mark II, and Mark III. Also includes ‘The Mars Tapes’, which is an archival release that Mark Murdock (drummer_keyboardist) helped put together, a few years back (2014). Informative liner notes that read like a mini-book. No stone unturned. The whole history of the Empire is there. Cool photos! Oh, and this part is really important; ALL the music contained in the 3 CD box set is NEWLY remastered. I initially passed on doing a write up, only because I typed thousands of words regarding Peter, and even Empire in the past. Was worried about repeating myself. Add to that I had other writing assignments I wanted/needed to get to. But then while napping, in a dream, a 60 foot 40’s something female prog-rock fan spoke to me while I drank a chilled beverage on a very hot day, outdoors and as happy as could be in the middle of a beautiful Colorado park. Snap … I was awake. Then a few weeks went by. Got semi caught up with what was on my ‘to do’ list. Arrangements were made, and one day via snail mail … it arrived! In a padded envelope. Carefully wrapped in tissue paper and bubble wrap. Three CD plastic jewel case: Empire (featuring Peter Banks & Sydney Foxx) – The Complete Recordings. I consider myself a fan/follower of guitarist Peter Banks since the year, 1975 (Yes – Yesterdays). Over two decades later I would help him promote an autobiography (insert name_author), along with my good buddy … music promoter, author, musician, and friend; William (Billy) James. Can’t say that experience ended well. A close friend from back in the day literally fucked that ALL up for me. I mentioned the ‘PB MB Incident’ before and only do so now so to give a bit of background about myself, and to make this a more enjoyable reading experience. Remained friends with Billy all this time. My friendship with PB crashed and burned! In any write up I done previously regarding Peter Banks, I always tried not to be biased. Fact is I can and have on many a day, listened to music that Peter was involved in, all day and all night. Empire was a part of that. Any average modern day prog-rock follower, or old school progressive rock fan not acquainted with Empire would conclude after giving this new Empire archival project (expertly put together by Cherry Red Records) a couple/few listens, that the band’s music is actually pretty solid. All three CD’s presented here could be played from start to finish. No skipping tracks. Sound quality is wonderful! Noticed it right away, for I am the owner of all three Empire CD’s that were put out in the 1990’s. Not easy acquiring all three. Peter told me while on the subject that he couldn’t say exactly the number of units produced and sold. He knew what they told him (insert the sound of hysterical laughter). Personally, I can’t imagine a large amount myself. Collector’s items today. A number of musicians made up Empire throughout their eight year history. The band was kept going primarily recording contract to recording contracts. One expired or fell through, and Mr. Banks would find another. Peter Banks and Sydney Foxx stayed from beginning to end. Eight years work. No live gigs ever! Very much a band, whatever the players were. Seriously guitar driven! The music was mostly produced by Peter. Main songwriters were Pete and Sydney. Cool guest players like Phil Collins and Ray Bennett (Flash). Well rehearsed (whatever combination of players). Three studio albums yet the music was never released when Empire was alive and breathing. I appreciate the resurrection. Fact is Empire was a failed business. Money generated kept things afloat. And like everything else, when that cash flow finally dried up, so did Empire. Major loss! I can understand Peter’s bitterness years later. The man was very public about his dissatisfaction with the whole thing. Not ALL bad, certainly. I see this 3 CD Box Set as a celebration. Not only for Peter’s memory. Dude wasn’t the only one in Empire. People deserve to not only hear Peter’s incredible display of guitar skills but the rest of the band as well. Sydney Foxx is nowadays known as Sydney Jordan. An interesting career that includes being a Tina Turner backup singer, and appearing on a soap opera whose title became a popular expression. Not positive. If your life was a ‘Payton Place’, you’re in soap opera land. Married to Empire’s lead guitar player for a while. Has an absolutely beautiful voice. Since the songs in Empire varied so much in styles, Syd was able to display her full range of singing capabilities. In between Sydney’s vocals, wonderful instrumental passages. Sometimes I get the impression that Empire songs were Peter’s guitar playing, and others trying to compliment that the best they could. Capable of holding their own. Drummers like Mark Murdock expertly blended in. He is quoted as saying the most challenging undertaking (drum wise) was playing the Yes version of, West Side Story. The Empire version of that clocks in at over 17 minutes. Mind blowing! Using a five star rating system, whereas one star means one can easily blow past it, to five stars in which means it’s the BEST … I give the 3 CD box set Empire (featuring Peter Banks & Sydney Foxx) – The Complete Recordings … 5 stars! Nice job! My sincere appreciation to ALL involved, including the super cool; Cherry Red Records.